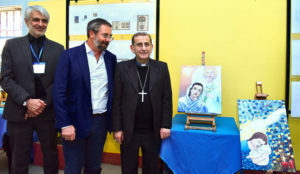 Archbishop Delpini with Mauro Olivieri (at left) and Silvio De Gregorio; at right the paintings by Marcello D’Agata [photo Church of Milan]. They are pictures “pouring from the heart,” says an emotional 70 year-old Marcello D’Agata, who for the last 25 years has been serving a life sentence at the Opera Penitentiary near Milan. In the process Marcello has nurtured his unexpected creative talent as a painter. Two of his paintings have now been adopted for the 2018 Christmas stamps issued by the Vatican on 9 November; their mission is to convey a global message of joy, peace and brotherhood. Three hands for first day of issue pictorial postmark: from left, Mauro Olivieri (Vatican Philatelic Bureau Executive), Archbishop of Milan Mario Delpini, and Penitentiary Director Silvio De Gregorio. 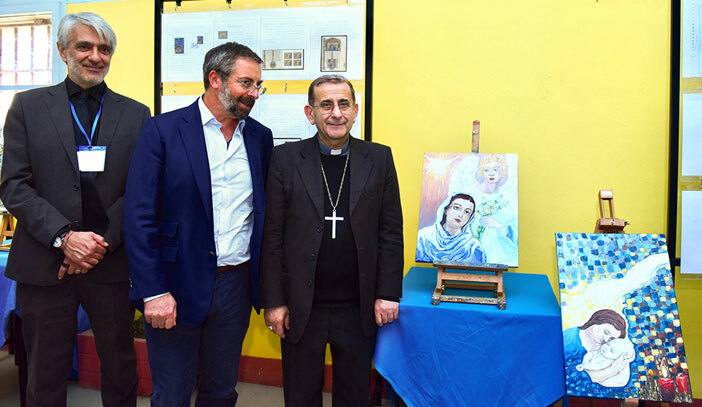 “We have decided to give Marcello D’Agata, a talented painter serving a life sentence, the opportunity to paint the “Annunciation” and the “Nativity” for two Christmas stamps (€1.10 and €1.15 respectively) and hosting their launch at the place where these works were created, the Penitentiary of Opera. These stamps are printed in sheets of ten and they are also offered in a booklet format with two stamps of each denomination as a mini-sheet. The first day of issue postmarks include the traditional one used by the Vatican Posts and that used today at the penitentiary: the former depicting two church candles from Marcello’s painting, the latter featuring St. Joseph Cafasso, the Saint patron of jails, while assisting an inmate,” says Mauro Olivieri, executive director of the Philatelic and Numismatic Bureau of the Vatican. He adds that “it is a sign of hope, trust and faith in our neighbours and in their ability to understand the wrong they did and to recover from it.” On the same wavelength is Silvio De Gregorio, director of the Opera Penitentiary, who speaks of hope for “real, effective and final rehabilitation” that can be achieved within the penitentiary.